July 30 of this year marks the 49th anniversary of President Lyndon B. Johnson sitting next to former President Harry S. Truman and signing Medicare into law. In 1945, President Truman had proposed a national health insurance that did not discriminate in regard to beneficiaries but it would take twenty years for his vision to be realized in the form of Medicare. Nationwide, nearly 50 million people or 15% of Americans are Medicare recipients. The state of Maine, has one of the highest percentage of people in any state - 21% of Mainers receive Medicare benefits to help pay healthcare expenses. Many of these recipients would not have access to the medical care they need if it weren’t for Medicare. In fact, in a recent survey conducted by AARP Maine of registered voters in the state age 50 and older, over half (51%) of respondents said they were very worried about not having Medicare benefits available to them in the future. When Medicare was passed in 1965, President Johnson had pointed out that “older people are three times as often to be hospitalized but their income is less than half that of people under 65.” The need for a program like Medicare was more than obvious in those times and that need has only grown over time as the population continues to age. Within the first week of Medicare being available, over one million people had enrolled. Almost fifty years later, the number of Medicare recipients has multiplied by close to fifty! 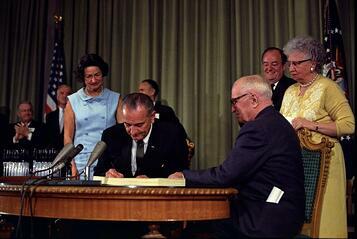 AARP celebrates the 49th anniversary of Medicare by recognizing the importance of the program. Though it took two decades for Medicare to be signed into law on July 30th of 1965, the fact that close to 50 million people are helped every day by the program proves that it was worth the wait. Find more resources from AARP about Medicare (http://states.aarp.org/category/maine), including this article and its history. Click here to Take our quiz for a fun way to test your Medicare knowledge!